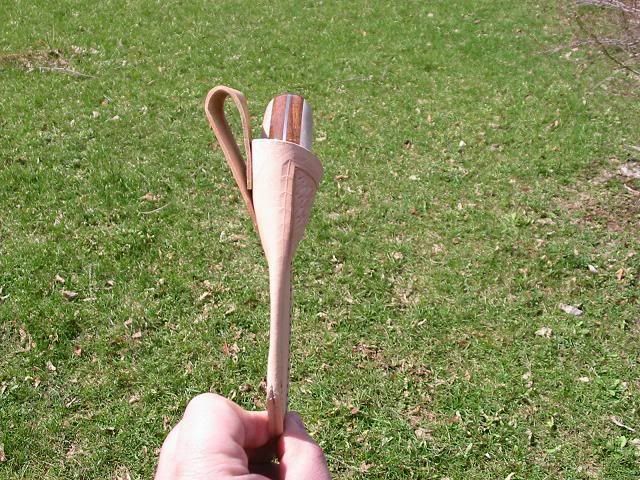 With the Drop point knife now done. 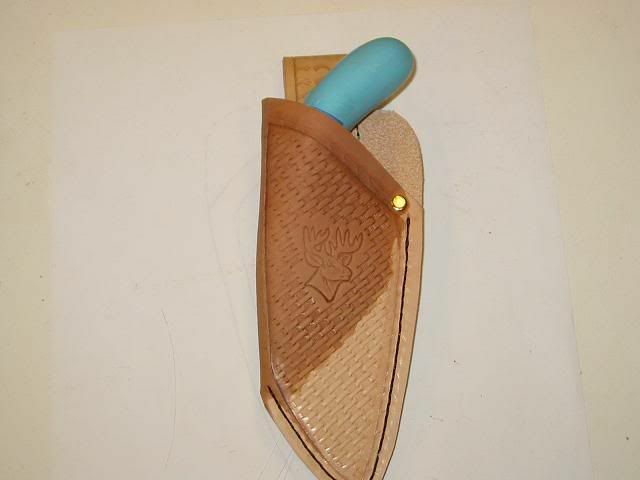 I started on the sheath. 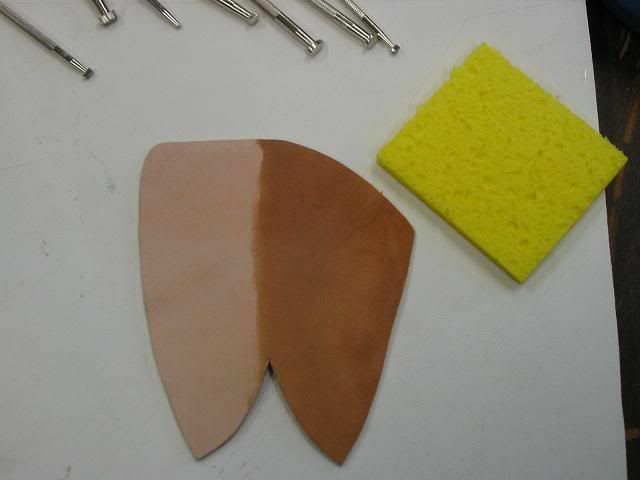 I am really getting into leather working. 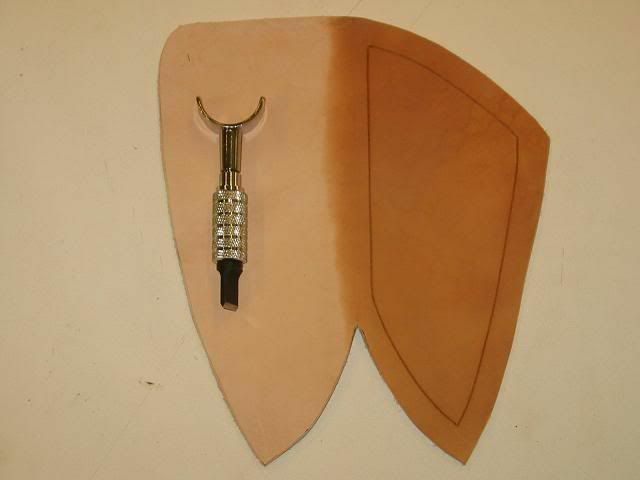 I started with a piece of scrap leather to come up with the sheath design. 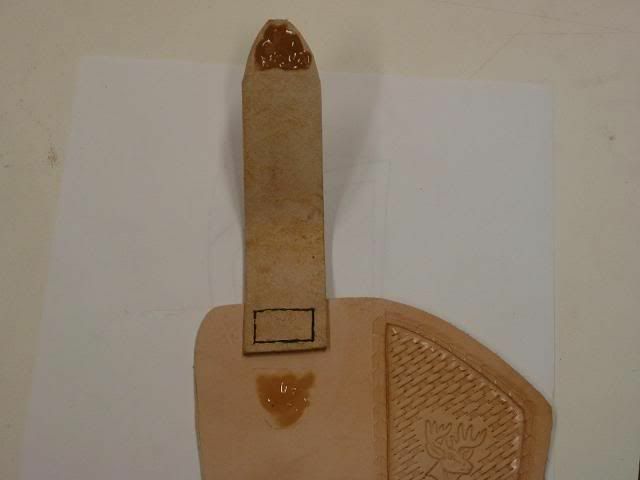 After a few tweaks, It's ready to transfer to the good leather. 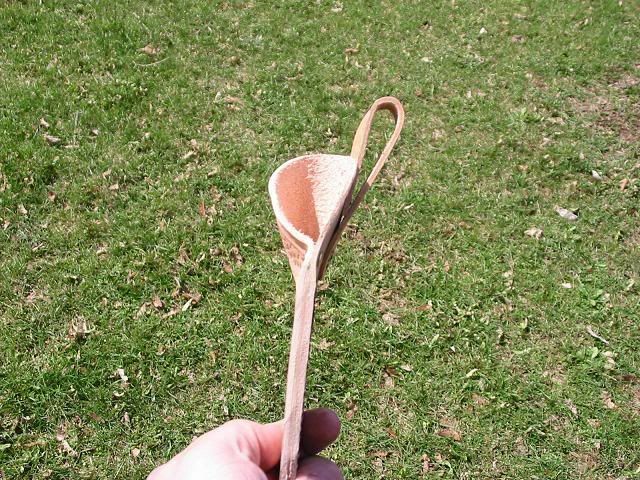 The good piece of leather is a 8 Oz. Veg tanned shoulder. 8 Oz. means it's slightly thicker than an 1/8 of an inch. 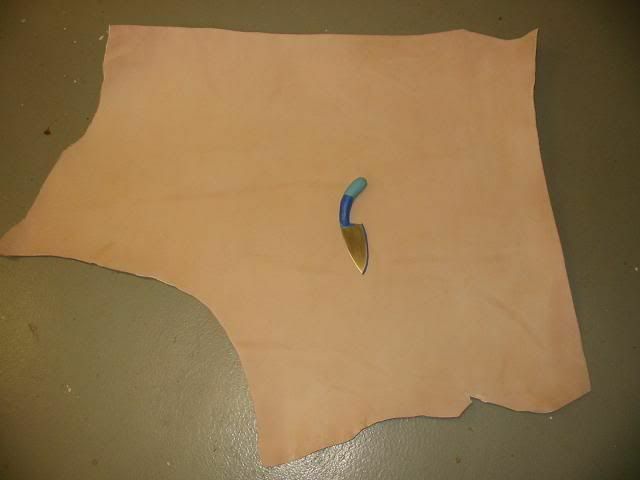 From this piece of leather I cut the sheath, The belt loop and the welt which gets sewed into the sheath to protect the stitching from the sharp knife blade. 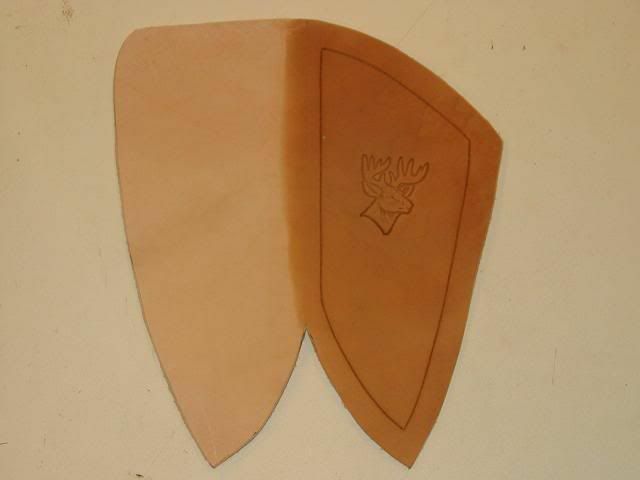 The design I want to carve and stamp into the leather is a simple one. 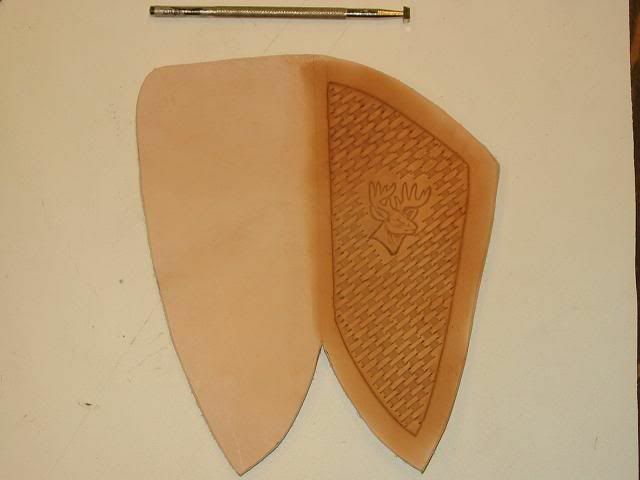 A border with a basket weave and a deer's head. 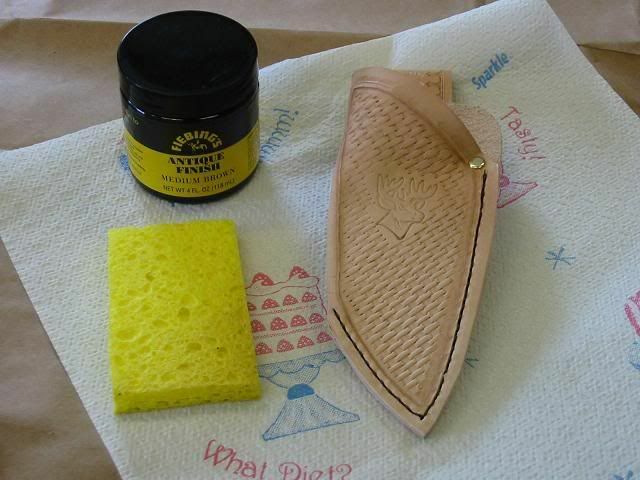 I wet (cased) the leather with water and a sponge so it would take the tooling I will do. 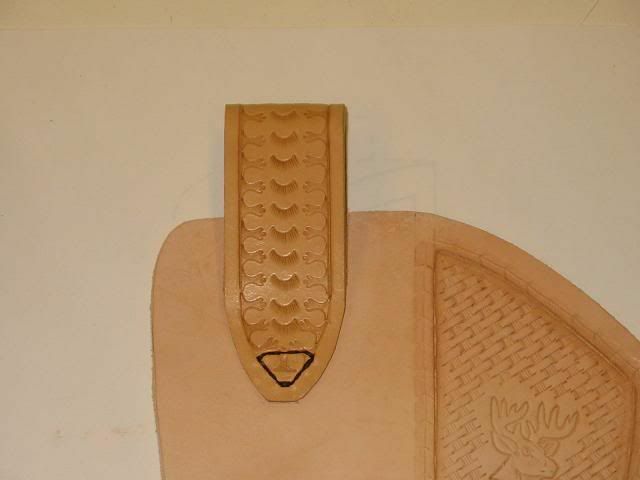 I then used the swivel knife to cut the border about half way deep into the leather. Next, I used a stamp with the likeness of a deer's head. 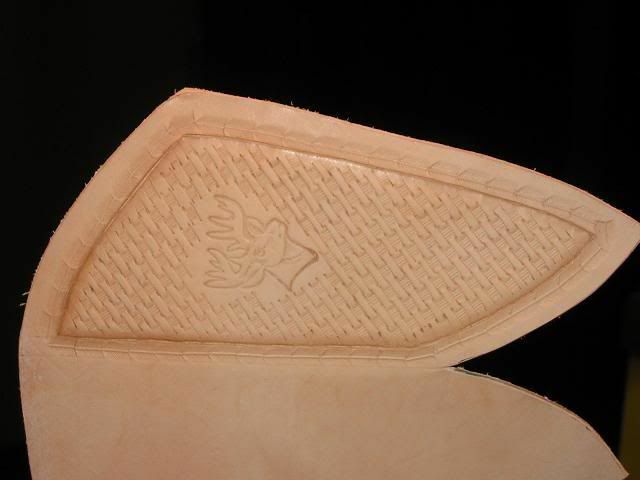 With the small basket weave punch (at the top) I kept striking the leather in an alternating pattern. Lastly I used a feather stamp and went around the border. When held up to the light, you can see the depth of the 3D pattern. 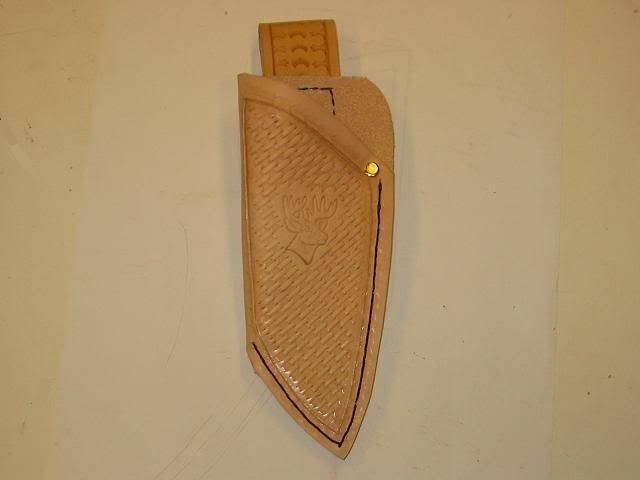 I finished the stamping part of the project by putting a pattern on the belt loop. Next up. Sewing it all together. theres room for all of gods creatures...and thats right next to my mashed potatoes! This is perfect Ron! 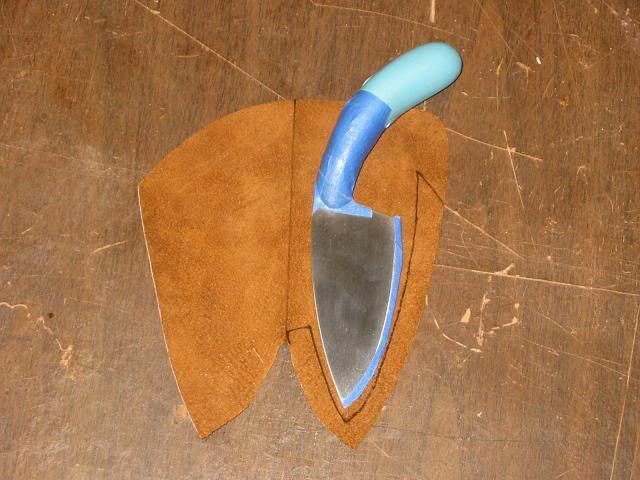 I have a knife that needs a sheath - I'm following this one step by step! I picked up a nice little knife from Fred Asbell at the Traditional Expo a couple of weekends ago. 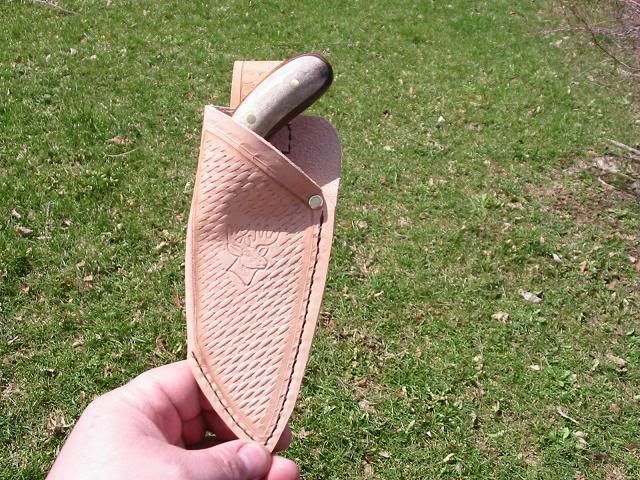 Now I can do a very functional sheath to go with it!! Thanks for your efforts in posting the process. Teacher..I ALMOST bought one of those knives (wished I had later). He only had one small one left when I took off. Which one did you get? Mark. I have never read any books or watched any videos so I can't recommend any. 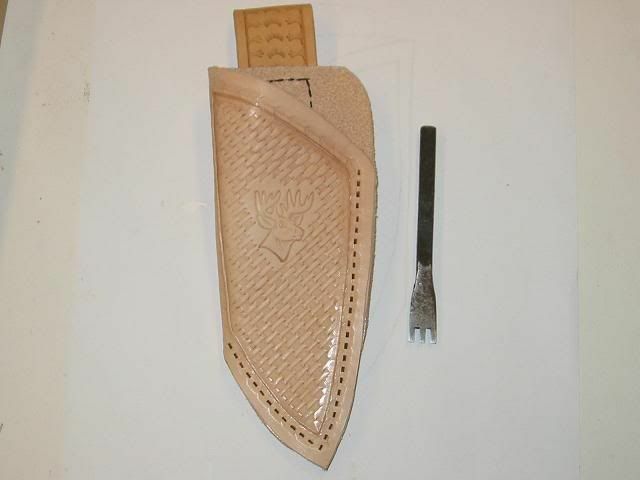 I have never really done much leather work until about 2 months ago when I made an armguard. I'm leaning as I go. The Tandy leather factory is where I have purchased all my supplies. I have asked a few questions while I was there. Mostly I do things by trial and error. 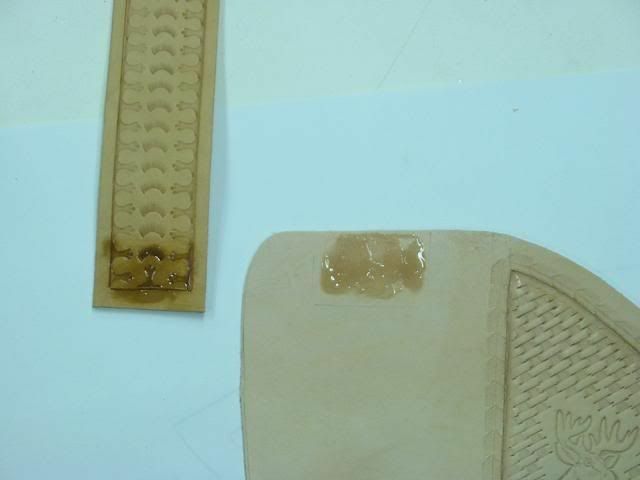 In order to hand stitch the leather, I find it easier to use contact cement to hold the pieces in place so after I punch the holes, things won’t be shifting and sliding around on me. 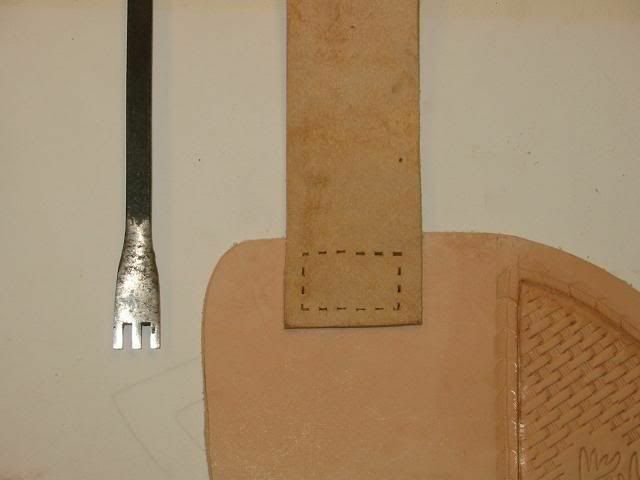 To stitch leather this thick I need to punch holes. 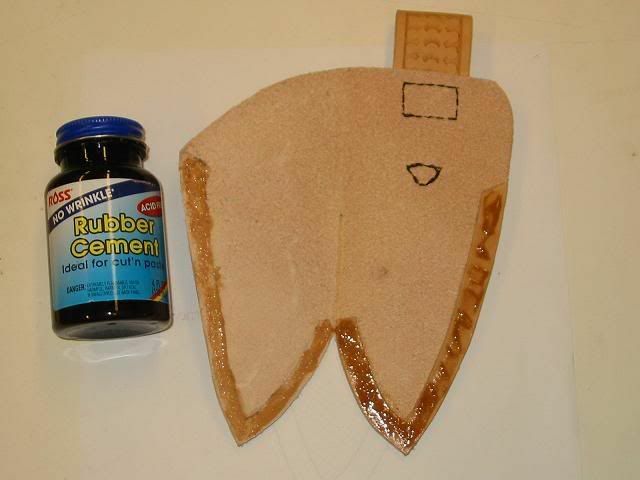 To do this I used a forked chisel punch. Then I repeated the process on the bottom of the belt loop. I am sewing with a heavy braided waxed thread with a breaking point of 35 pounds. 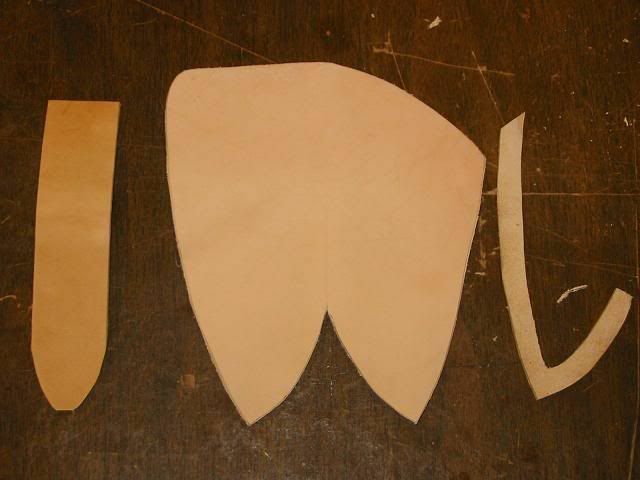 I have to sew through 3 layers of leather for the welt. The forked punch is not quite long enough to go through all the layers so it takes a little force to push the needle through. 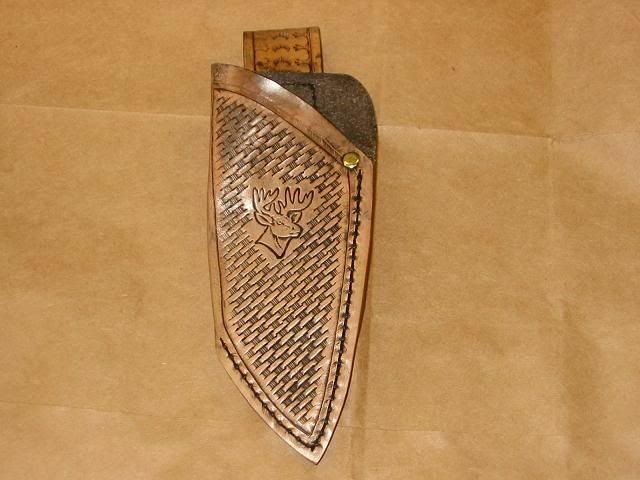 After stitching, I trimmed the edge all around and added a brass rivet in the high stress area. Next up. Coloring and finishing. In order to shape the opening and make it stay in that shape. 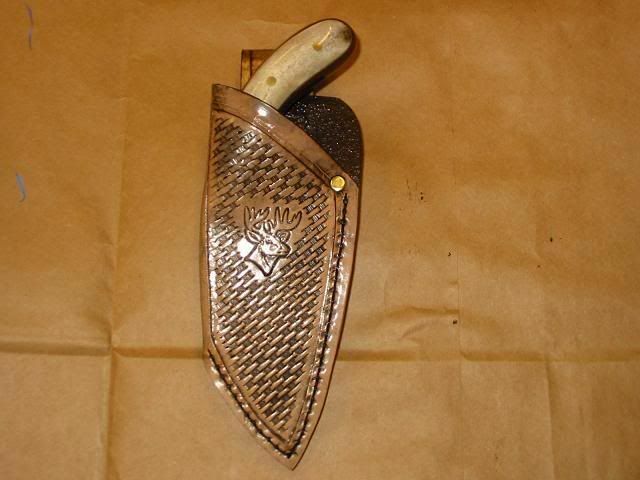 I wetted the leather and placed the knife back in the sheath. After clamping it and letting it dry for a few hours. 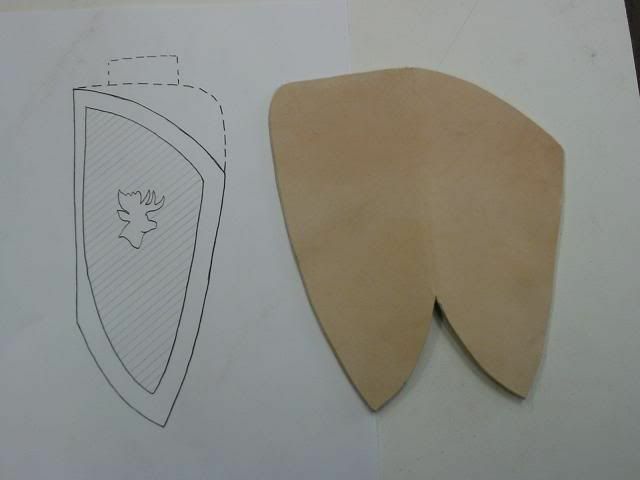 It took the shape nicely. Next. I added a little color to the leather. I used a product called antique finish. 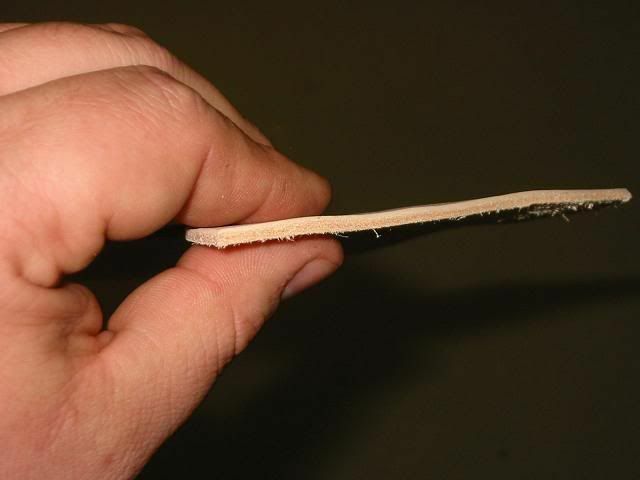 After applying the finish. 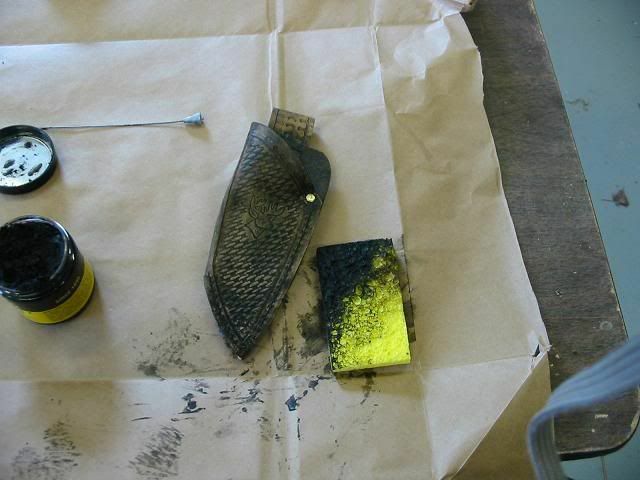 I wiped it off and buffed it. 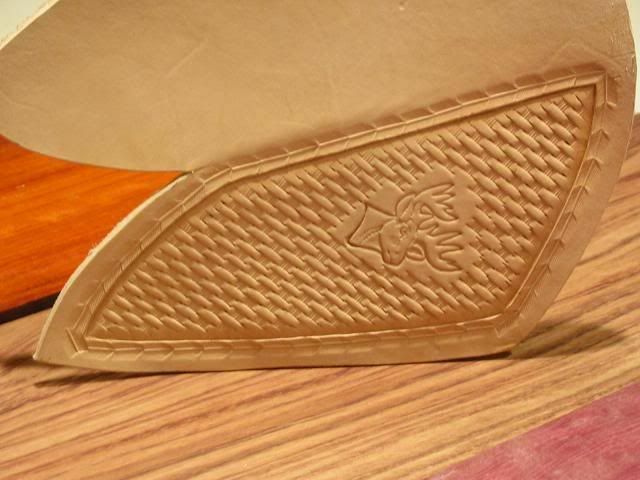 When it dried, I applied edge kote to the cut edges of the leather to make it smooth and make it shine. 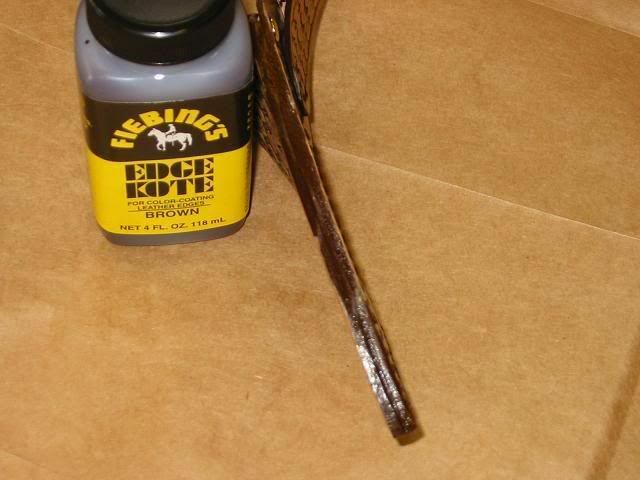 lastly, I added I applied 3 coats of super sheen to seal, waterproof and give the leather a nice shine. Project complete.